Capitol Coin Auction tops list! Competition among top coin-selling houses on Proxibid has become even keener, with only fractions separating one favorite company from another. Only one scored a full 25 points in all categories: quality consignments, detailed descriptions, quick and inexpensive shipping, superior photography, expert grading, reasonable buyer’s premium and other value-added considerations. Not only is competition growing, our audience is too, surpassing 1,600 views for the first 28 days in April. Capitol Coin Auction continues to feature some of the best numismatic estate auctions on the portal. Every few months it schedules an auction with key date coinage and holdered rarities. Moreover, as we noted in this recent post, Brad Lisembee ranks among the best graders in the business along with John Leonard of Leonard Auction. Also high on the numismatic grading list are Dave Nauert of SilverTowne Auction, Justin Quinn of Southwest Bullion and Coin, Dave Weaver of Weaver Signature Coin and Currency Auction, and Sean Cook of Liberty Shops Auctions. These were ranked ever so close behind Capitol at 24.5 each out of 25, along with Western Auction (one of our personal favorites) and Fox Valley Coins. Returning to the portal is Kaufman Realty and Auctions, with strong consignments, numismatic lot descriptions and good photography. If it shipped more quickly, it would challenge other top houses in our rankings. Darron Meares, one of our favorite auctioneers, elevated his company to the top rankings, too, with great consignments and much improved photography. Engstrom Auction continues to improve with better consignments. Its photography has been good, and its customer service is fine, too. Essentially, you should have an exciting time in the spirit of traditional auctioneering bidding in any auction by these top-houses. Rolling M Auctions is one of our favorite houses. Mark Murphy is going a fantasic job for Rolling M. with great consignments and fine pre-auction advertising. We think he can still do better with sharper photography that captures luster and provides an onsite view for the Internet crowd. Key Date Coin continues to showcase the best photography and auctions always worth a look. We advocate for better consignments as Eddie Caven knows how to feature premium lots. Star Coin and Currency continues to impress with improving consignments, neat photos and numismatic lot descriptions. New on the list this month are Atlantic Auction Company and Cannon Auction whose Honor Roll features include 15% buyer’s fee, good photography and numismatic lot descriptions. Rapid shipping with professional packing. Sharp, expandable photos of both sides of a coin. 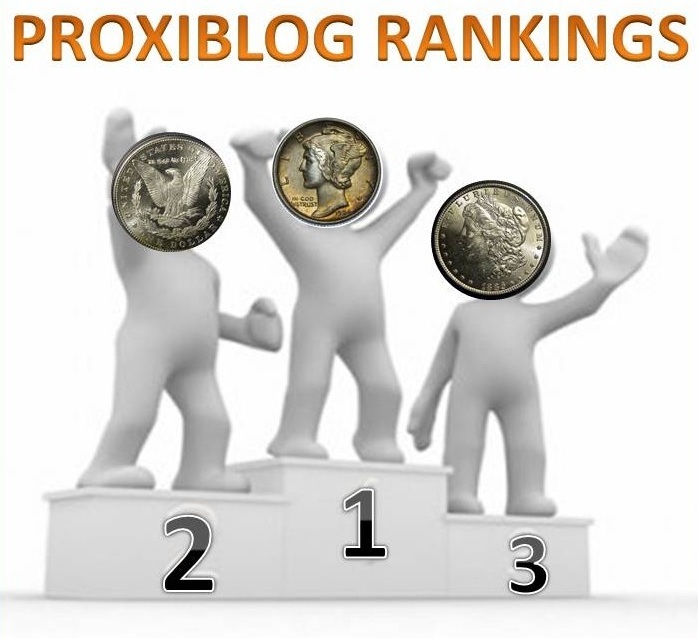 That said, our rankings are reviews of favorite houses based on our buying and/or selling experience and numismatic expertise. Your experience with our top houses may differ from ours. Our intent is to educate and praise whenever possible–to our own buying detriment, at times! We have seen when we showcase an auction house how bidding becomes more intense, often edging out our own bids. Perhaps this is due to the rise in our viewership. 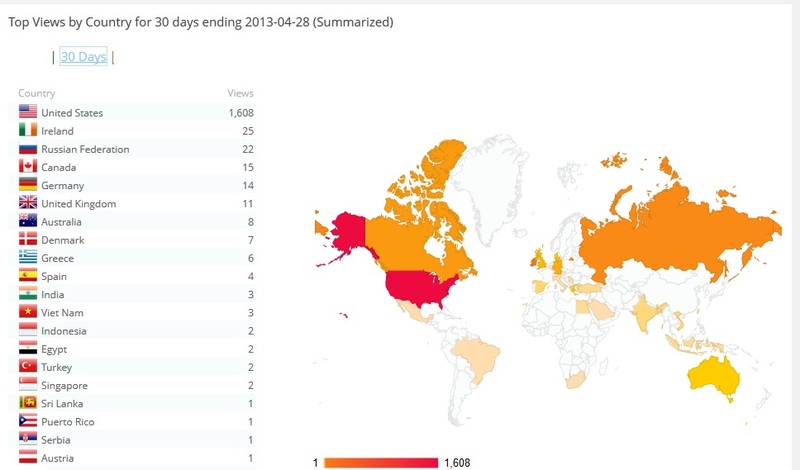 As the screen shot below shows, more than 1600 page views were logged in the first few weeks of April alone. Also becoming more popular are our “Find the Flaw!” features, designed to improve grading skills. This entry was posted in Rankings and tagged American Numismatic Association, Atlantic Auction, Auctioneers, AuctionZip, Best Practices, Brad Lisembee, Cannon Auction, Capitol Coin Auction, Coin Auction, Darron Meares, Dave Nauert, Eddie Caven, Fox Valley Coins, iCollector, John Leonnard, Kaufman Reality and Auctions, Key Date Coins, Leonard Auction, Liberty Shops Auction, Mark Murphy, National Auctioneer Association, Proxibid, Proxiblog, Rolling M. Auctions, Southwest Bullion, Star Coin and Currency, Western Auction. Bookmark the permalink. ← 1901 VAM 3 Shifted Eagle Was Correct Answer!